A paint batch being mixed. This case study is republished from Grow Your Factory, Grow Your Profits: Lean for Small and Medium Sized Manufacturing Enterprises by Timothy McLean and published by Productivity Press. 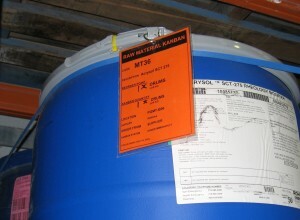 Our customer was a medium size paint manufacturer. They had invested heavily in an ERP system and used the materials resource planning (MRP) functionality in this system to plan its production. Using MRP first involves establishing a set of master data in your system for every customer, product, parts and materials used, and asset employed. That includes maintaining accurate bills of materials and routings for every job. In addition a set of master production schedule (MPS) settings are established, which includes data about optimum batch sizes, lead times, and safety stock requirements. The paint company used this information to develop a weekly forecast and loaded the information into the ERP system. The MRP function ran overnight and scheduled the required production time, materials, and inventory to meet the forecast requirements. In lean manufacturing terms we call this push scheduling, where the supply of raw materials and work-in-progress are pushed to the next production step in anticipation of future demand. The problem, of course, becomes forecasting demand for every product (SKU) every week. Despite a lot of effort, high inventory, and relatively good forecast accuracy, the customer still had constant problems with shortages and rush orders in production. The trigger for the inventory was changed from forecast to usage by establishing a Kanban system. The daily sales of products became the trigger to replace stock. A report was sent from the distribution center to the factory each day. This report told the production planner which products she needed to manufacture next. The level of finished goods stock was determined from the lead time needed to replenish the batch and the batch size. As a result, finished inventory was reduced by 30 percent, and shortages were reduced to almost zero.